In recent decades the global wind energy industry has undergone explosive growth, and there is still vast potential for wind to supply more of the world's energy. Though not only is wind power far from reaching its potential, its rise has been uneven and irregular. What factors influence the development of the wind energy industry, and why has it developed successfully in some places but not in others? In Winds of Change, Ion Bogdan Vasi argues that the development of wind energy is dependent not only on improvements in technology and economic forces, but also in large part on the efforts of the environmental movement. Vasi defines and analyses three pathways through which the environmental movement has contributed to industry growth: it has influenced the adoption and implementation of renewable energy policies, created consumer demand for clean energy, and changed the institutional logics of the energy sector. Vasi uses quantitative analysis to present the big picture of global wind power development, and qualitative research to understand why certain countries are world leaders in wind energy while others are relatively underdeveloped. Through interviews with renewable energy professionals and campaigners, he shows that environmental groups and activists participated actively in energy policymaking, pressured various organizations to purchase wind power, and formed new companies that specialized in wind-farm development. He also demonstrates that environmentalists contributed to wind turbine manufacturing by becoming entrepreneurs, innovators, and advocates. 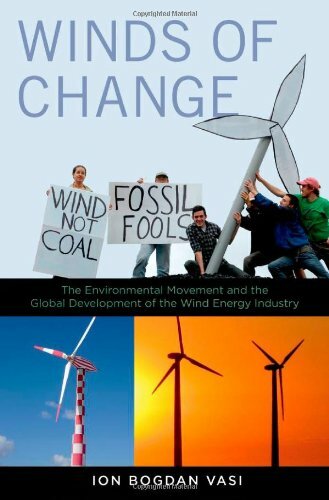 Winds of Change sheds much new light on how wind energy is adopted and why, and demonstrates how activists and social movements can contribute to the creation of new industries.